Believing that there is always victory in unity, the Heinrich Böll Stiftung Nigeria office brought diverse Nigerian writers together facilitated by the people from Booksprint to write on the country they know and love. This group of eight Nigerians - Rafeeat Aliyu, Fola Lawal, Kalu Aja, Chioma Agwuegbo, Pearl Osibu, Yas Niger, Elnathan John, and Azeenarh Mohammed - with a common vision, worked together to inspire change. Together they wrote and wrote for five days, day and night and they found “Nameless”. FUN FACT 1: Did you know Nigeria's national bird is the black crowned crane? 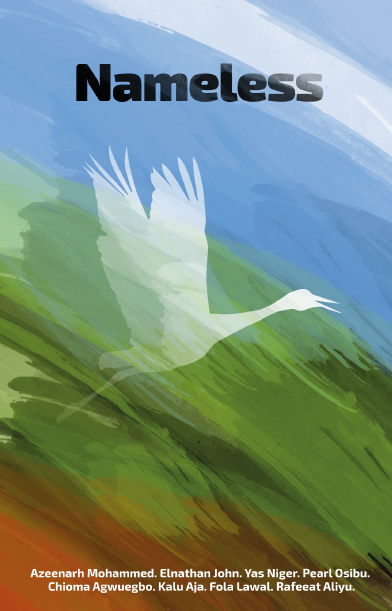 The silhouette of the bird was the inspiration on the cover of the book. You can read about how the writers found this out on various blogs that the writers and facilitators kept during the sprint here, here, here, here, and here. FUN FACT 2: Nameless was written under creative commons atribution-non comercial 4.0 which simply means it is completely free of charge. You can download a pdf or epub above or stop by the hbs offices for coffee and a free copy. Opposite Jabi Motor Park, Jabi District, Abuja.